If you know me, you know I had to make a stop at the Souk to do some shopping! Some of the most beautiful rugs I have ever seen were here, and I’m so sad I didn’t have more room in my suitcase to take them all home! This area is a bit hectic so just know you have to be aware of your surroundings. Also, I wouldn’t recommend going to this place by yourself as it can be a little bit intimidating. Besides that, the place is really cool, there are some great restaurants there and you can shop a little bit of everything! I negotiated a few prices on a straw bag I couldn’t leave the Souk without! This is one of the biggest attractions in Marrakech. Yves Saint Laurent and Pierre Berge bought the Majorelle Garden after many visits to the garden in the 1980’s, and ultimately saved it from being turned into a real estate development! Now thousands of people get to see the beauty they both saw every single day. Being there and seeing the garden was truly incredible. If you are looking for amazing lighting and a romantic atmosphere Le Restaurant Selman is the place for you! Not only is the food to die for, but it is also in the Selman Marrakech. The high ceilings and Moroccan color scheme make for the perfect date night, not to mention the food! Also, they serve breakfast there in the morning. Quattro was another one of my hotel favorites. 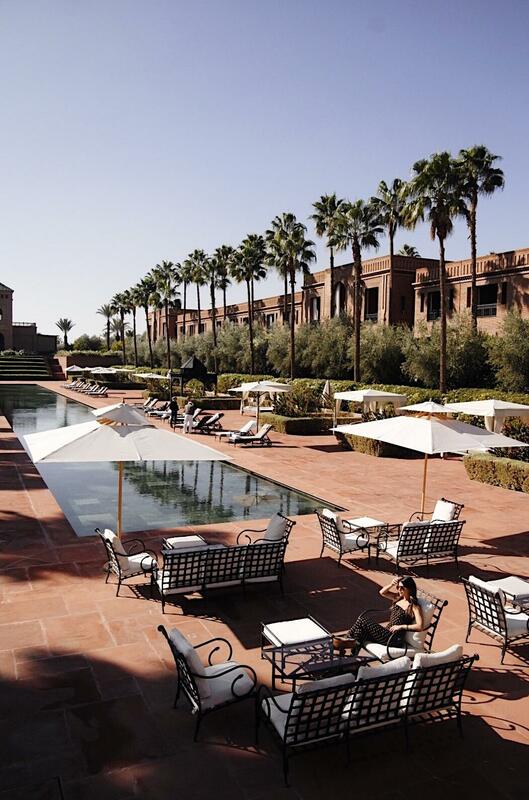 This time, from my stay at the Four Seasons Marrakech. If you are craving different food, Quattro offers an amazing blend of Italian and Moroccan options. One of the more unique restaurants we went to during the week! Nomad Marrakech is located at the Souk and is a great place to go before or after shopping! It’s a bit hidden but if you ask around people are super nice and direct you to the right place. Comptoir Darna is a great place for authentic Moroccan food! It’s super lively and a great place for drinks! There are live shows, music, belly dancers, and ultimately was my favorite restaurant during the trip! Azar had a very lively atmosphere and had a very fun and energetic crowd! It was super fun because of the live music and people, the great food was just a plus! Bo & Zin is a very chic place for small bites and drinks. It is a great place to start the night before going out on the town. For a different option while in Morocco, Raspoutine is a chic nightclub that offers both food, drinks, and of course an amazing time! The weather in Marrakech varies throughout the day and night. During this time of the year, it can be hot during the day and cold at night. Most of the locals recommended visiting Marrakech during April as the weather is perfect during this month – not too cold not too hot. If you do end up traveling in December, I would recommend bringing pieces you can layer at night. Also, don’t wear anything too revealing outside your hotel. Women still dress pretty conservatively over there so keep that in mind. I wore this dress with a jacket on and I took it off just for the gram haha. Here are some of the looks I wore during the trip.